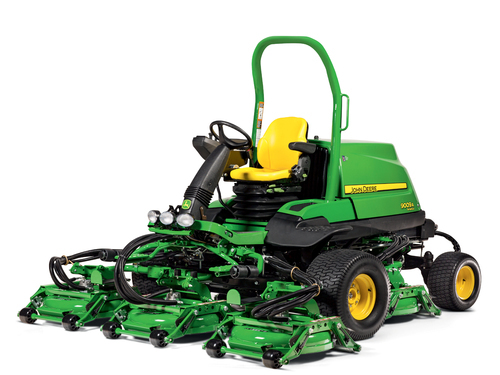 Combining higher capacity mowing with premium cut quality and after-cut appearance, John Deere’s new 9009A TerrainCut rough mower is the latest addition to the company’s award-winning A Model family of fairway, rough and tees & surrounds mowers. It will make its UK public debut at BTME 2016 in Harrogate (19 to 21 January, stand M3). “With the new 9009A TerrainCut, our widest model yet, you can now maximise both productivity and cut quality from a wide area mower while having more control over how the machine performs in the rough,” says John Deere Limited turf division manager Chris Meacock. The 9009A has five 68.6cm (27in) independent rotary mower decks, providing an overall cutting width of 2.7m (9ft). Rated at a maximum 55hp, the powerful, direct injection four-cylinder diesel engine uses integrated cooled exhaust gas recirculation (EGR) and automatic particulate filter cleaning to meet Stage IIIb emission regulations. A deep-shell deck design with unique rear discharge stands the grass up for a cleaner cut, while dispersing the grass clippings more evenly over a wider area. In addition, height of cut adjustments can be performed without tools using an innovative notch system, simply by pulling a lever. LoadMatch transmission settings also provide consistent cut quality and excellent climbing performance, while the AutoPedal feature lowers sound levels and fuel consumption during transport. The mower’s established TechControl system delivers premium control for operation, maintenance and diagnostics. Using different screens on the password controlled TechControl display, you can electronically set the mowing and transport speeds simply and quickly by pressing a button. In addition, turning speed can be slowed down to a set percentage of the mowing speed when the cutting units are lifted after a pass, which greatly reduces scuffing. Full details and prices of the new 9009A TerrainCut rough mower will be available from Farol Ltd from December 2015.